"I design from the inside out so that the finished product looks inevitable somehow. I think it's important to create spaces that people like to be in, that are humanistic." Frank Gehry loves to sketch. It is the beginning of his architectural process. From Gehry’s sketches flow the models, one after another, each a refinement, that will eventually become finished buildings unlike any others in the architectural world. It is this sketch quality, what he calls the “tentativeness, the messiness,” that Gehry clings to as a way of guarding against formula or repetition. And it is this sketch quality that Sydney Pollack was so keen to explore in the film SKETCHES OF FRANK GEHRY, seen on AMERICAN MASTERS. Beginning with Gehry’s own original sketches for each major project, Pollack’s film explores Gehry’s process of turning these evanescent, abstract drawings into tangible, three-dimensional form: finished buildings of titanium and glass, concrete and steel, wood and stone. Working closely with his colleagues, Gehry takes his sketch ideas and, as quickly as possible, makes them three-dimensional, the better to see how his buildings work, how they fit with their neighbors, how they function in the most essential way. Model after model is scanned into a sophisticated computer and rendered into working drawings. 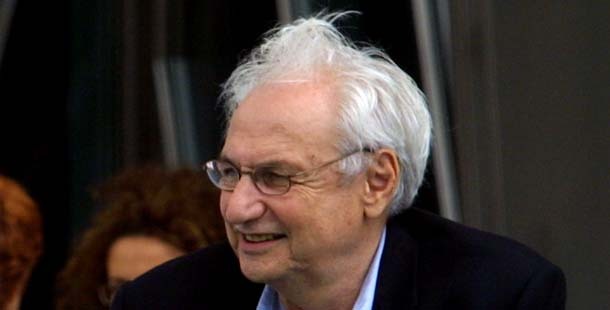 Frank Gehry is that rare kind of architect who has garnered both critical acclaim and popular fame. Not since Frank Lloyd Wright has an architect been such a household name. Gehry’s designs dramatically blur the line between art and architecture, yet the strong appeal of his sculptural designs does not obscure the role of function. He follows a painstaking process of subtle vision and revision both in his sketches and in his model shop. It is a common misconception that Gehry’s buildings are constructed as mere containers, built for the sake of their form. In truth, the buildings are built from the inside out. Wooden block massing studies are constructed and reconstructed in step with Gehry’s own evolving sketches. Gestural models of cardboard, wood, and cloth act as intermediaries, keeping Gehry conscious of the three-dimensional implications. The process, as Gehry admits in the film, forces him to “work in two or three scales at once.” This forces him to forget about the model as an “object of desire” and instead to concentrate on how the building works. Based in Santa Monica, Gehry works with a formidable team of architects and model makers to bring his sketches to life. The resulting structures are imbued with the dynamic energy of Gehry’s original sketches and with the improbable nature of his study models. The interiors are both grand and unpredictable at once. This process is perhaps best illustrated by his two seminal works: the 1978 renovation of his own house, what has since come to be known as the Gehry Residence, and the Walt Disney Concert Hall in Los Angeles, opened in October 2003. It is a classic piece of Gehry understatement, and of Gehry humor. He didn’t mess with the old house. Instead, he reworked the architecture in the most radical way, leaving the original house almost intact so that it became a house within a house, where one wall of his new kitchen is the clapboard wall of the original house, complete with windows, moldings, and wood details. 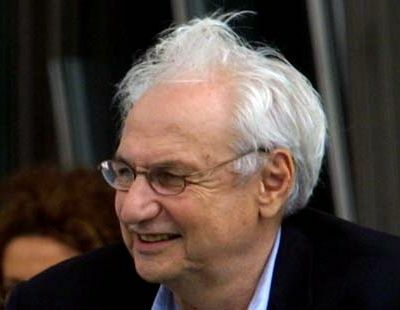 In the film, the camera moves from the living room (the old house) to the kitchen (the new house), dramatically revealing the bravura of Gehry’s inside-out gesture. Gehry and his wife, Berta, raised a family in this house, where they still live, a thirty-year testament to the fact that, for all the artistic flourishes of his ideas, Gehry’s architecture works, in the most practical and fundamental way. When the Walt Disney Concert Hall opened in 2003, it was quickly recognized as perhaps his greatest work-and again, for reasons, first and foremost, of functionality. The acoustics of the hall were widely praised, not least by the musicians in the Los Angeles Philharmonic, under maestro Esa-Pekka Salonen. In the three years since its opening, the Walt Disney Concert Hall has become one of the great performance venues in the world, and not just for its acoustics. It has become a symbol of downtown Los Angeles as a center of culture. Comparisons between the Guggenheim Bilbao and the Walt Disney Concert Hall are inevitable. They were designed more or less at the same time, although the Guggenheim opened some six years earlier than the Walt Disney Concert Hall, in 1997. The comparisons go beyond the obvious flamboyance of the shapes and the functionality of the spaces. SKETCHES OF FRANK GEHRY shows Gehry’s concern for the people who live and work in his buildings, and how his buildings function as spaces for people: how they embrace and envelop the people in and around them, and how that embrace is returned. This is a unique quality of Gehry’s works, and just one reason his fame is so widespread and universal. People feel welcome in his buildings; they feel, as artist Julian Schnabel says in the film, encouraged. Sydney Pollack’s shots of visitors ambling in and around the Guggenheim Bilbao and the Walt Disney Concert Hall are reminders of how connected people feel to Gehry’s architecture. This, for an architect, is the most welcome validation of all.